Release 2.4.6 was pushed out a week ago that fixed an issue with Android releases 4.2.2 – 4.4.1 where the app would launch but adding stations didn’t function. Version 2.3.0 of Weather Pilot for Android has been released. This update adds viewing of the previous six hours of METAR data for a station to the main view. Click on METAR History under the station weather box to see the history. To get back to the main view that shows both the latest METAR and TAF click on Current. An additional menu was also added that will serve as the application menu for things like Settings in the future. For now it provides a link to the About page for the application that lets users know the current version of the application they are running and how to contact me with support questions. Android users of Weather Pilot experienced an issue last week where METAR and TAF data was not showing in the app. The issue has since been resolved with a new version of the app getting released. Version 2.0.1 of the app is currently active in the Play Store and should fix the issue. Since this version of the app was a complete rewrite not all features are the same in this latest release. Currently a link to the map view of the weather station is not available but will be made available in an upcoming release. One new feature is the ability to save favorite stations for quick retrieval in the Add Station window. I am sorry for any inconvenience the recent outage may have caused. With this latest release I have plans to add new features to make the app even more functional to pilots, meteorologists, and weather enthusiasts alike. I am aware of the issue with Weather Pilot not retrieving METAR and TAF data. Will be working on a fix for the problem this weekend. Sorry for any problems this may be causing you. 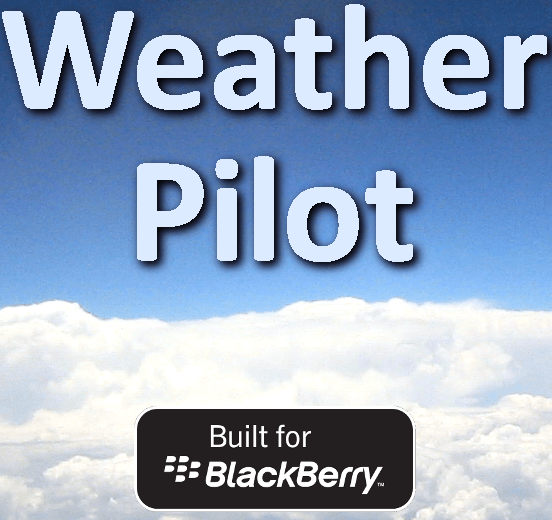 If you haven’t received a notification from BlackBerry World take a look now because Weather Pilot 10 for BlackBerry has been updated to version 2.1.0.6. Hope you were able to go ad free over the last two weeks as the sale has officially ended. For the next two weeks the in app purchase to go ad free in Weather Pilot has been reduced by 50%! Get it before the price goes back up. Over the last few months I’ve been working to get the BlackBerry version of Weather Pilot 10 certified as a Built for BlackBerry application and at the beginning of June it happened!